And there was an unexpected knock at the door. The kids were fast asleep, so I quietly tip-toed downstairs and peeked through the window. It was my dad. From time to time, my dad will stop over unannounced so I wasn’t all that surprised. But on this particular occasion, I knew something was different (no one stops by when the kids are sleeping- enter at your own risk!). He handed me a magazine. “If you turn to page 96, you’ll see your recipe from The Clever Cookbook. Congratulations sweetheart, you’re in Oprah Magazine” he said. I nearly passed out from excitement! My editor told me about the feature before it was published; I just didn’t know when I would see it for the first time. The moment was something I’ll never forget. I could hear my heart beating while I froze outside (no socks) skimming through the pages like a maniac. What a fantastic surprise! 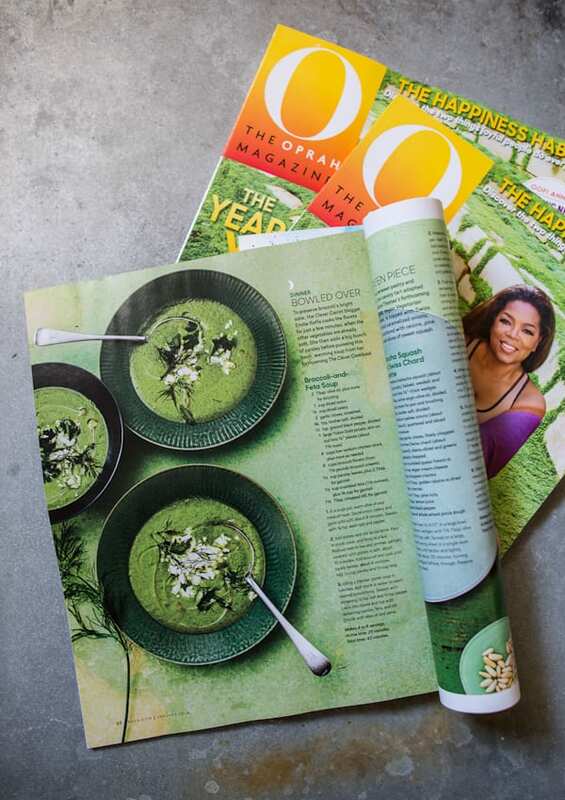 So, the next time you’re out and about look for the latest issue of The Oprah Magazine (January 2016). You will get a sneak peek of my 30 Minute Broccoli and Feta Soup from The Clever Cookbook. The recipe is part of their ‘Green Gems’ feature. Available worldwide! I do hope you get a chance to see it. And if not, I will be giving away a few signed copies! That is wonderful – congrats! I also think it is sweet that your dad came over in person to tell you. This is so exciting! I’m very happy for you. Congrats—-hard work does pay off. How exciting for you! Congratulations! And it is precious that your dad was so excited he had to come over right then and there. He must be so proud. Amazing Em! Brava! happy new year! WooHoo Emilie, that’s wonderful, congratulations, you so deserve it! Happy New Year Girl! From all of us at Spice Society! WOW…maybe you’ll be on the list for next years Oprah’s favorite things:). How wonderful to be noticed. The soup sounds wonderful & I will be trying it. How exciting, congratulations Happy New Year. I will look out for the magazine in the new year. 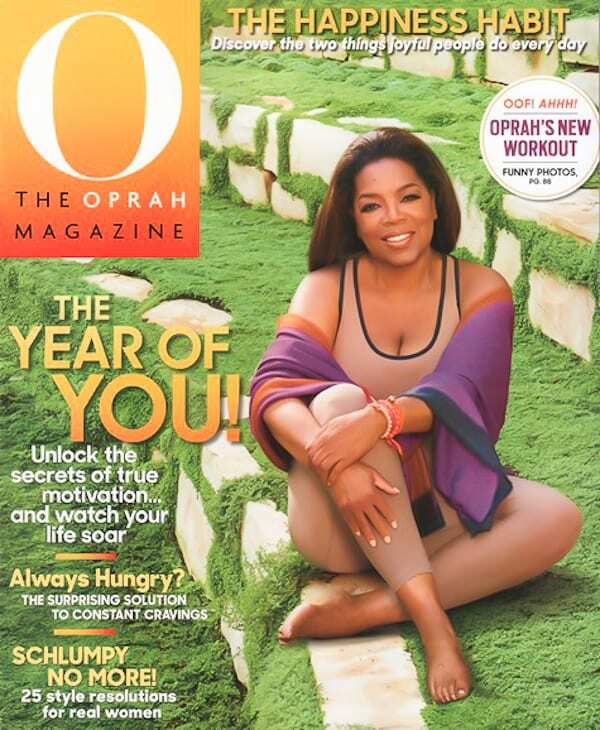 This issue has been sitting on my desktop for about a week or so…I was waiting to crack into it after the new year…I cannot believe you’re in Oprah(!) – I take that back…I can believe it(! )…but I am beyond excited for you! Congratulations on all of your wonderful accomplishments this year, my friend! I am buying my copy today. This is a humongous achievement. Much love and cheers to your success Emilie! Well deserved! How Brilliant! Congrats a million times! Congratulations! That broccoli soup looks wonderful, and I can’t wait to see the rest of the book. I’ve been following you for awhile! I’m soooooooo happy for you! A very hearty congratulations on the magazine article and on the book. I hope your 2016 is even better. I’m brand new to your site-I have to say wow and congratulations! You’ve paired two of my favorite foods-can’t wait to try your recipe!! Love your recipes. I have been making your recipe for chocolate sourdough. It is a big hit. Have used it as hostess gifts and Christmas presents for friends. Even sold some as part of a fundraiser to bring a Syrian family to our commitment. It’s great to watch you succeed. You deserve it. Your dad must be so proud. Oh wow that must be so exciting for you! Congratulations!!! What an absolute thrill for you and your team! Having Oprah Winfrey acknowledge you is on par with getting a nod from the Queen of England. Words escape me if how proud I am of you. HAPPY NEW YEAR! Congratulations! Looking forward to picking up the magazine, and your book. The book. Wohoo! Congrats Emelie, to the feature and the book launch, so exciting! Can’t wait to see the contents. Wow wow wow!! What an accomplishment! This means you officially “made it” in life if you ask me. Oprah is the Queen! And your recipe looks beautiful!! Congrats Emilie!!!!! I love that your dad saw it and it meant that much for him to drive over to your house at 9:30pm! soooooo sweet!!! Can’t wait to read your book! and I will definitely pick up the magazine! Congrats and I hope you enjoy everything that is about to come your way!!! woot woot!!! So excited for you & the recipe!! Somehow I found you through Cup of Joe. Not only is your recipe creative and a visual powerhouse, it sounds delicious. can’t wait to try it and also your other amazing meals. Brought tears to my eyes! This is awesome…I am applying to law school, and was going through some papers…I came across one you and I were working on, regarding our infamous historical writing class. I am very excited for you!!! You have always been awesome! Can’t wait to receive the cook book. That is so cool. Congratulations!!! I so enjoy your website it is refreshing and beautiful Thank You! Congratulaions! What an awesome way to start the new year! So happy I found your page!!! That’s very exciting! Your site is a gem! Best of luck. Amazing! Beautiful soup! :) I can not wait to check out the cookbook. Amazon emailed that your book was on it’s way!! !